Knit, Knit, Knit, Knit, Knit. I know I dissed you a few posts back, refusing to comply with Earth Hour. However, I think your revenge has gone far enough. First you shut off all my electricity for 24 hours and now you have stomped your big high-heeled foot all over the UK and northern Europe. I have waited eight, yes eight, long years to travel back to England. I have packed and re-packed, checked and re-checked travel information, advised everyone who needed to be advised (and a few who didn't), papered my home with Post-It notes, had nightmares about plane crashes, basically I have worked through every possible worst-case scenario...except this one. 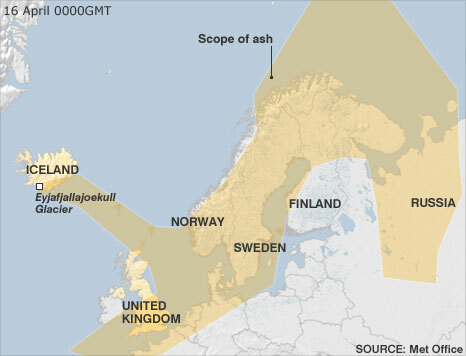 Who could have imagined that a volcano in Iceland could shut down miles and miles and miles of airspace? And why this week? And here I was worried about an impending strike by fuel-pump persons at YVR. I'm sorry, Mother. I will never do it again. Next year I will turn off all my stuff for two hours. Just please blow all that crap out of my way by Monday, ok? Wow, it sounded like so much fun!